Leeds has plenty of big, brash, flashy bars serving alcopops to the townie masses. You generally won’t find a great deal of decent beer in these places, and if you’re anything like me at all, you probably won’t have a good time, either. At the other extreme, there are a lot of traditional pubs that provide everything that a traditional pub should, but could never be described as ‘fashionable’. There’s a space in the middle too, and it’s this little niche that North Bar falls into. 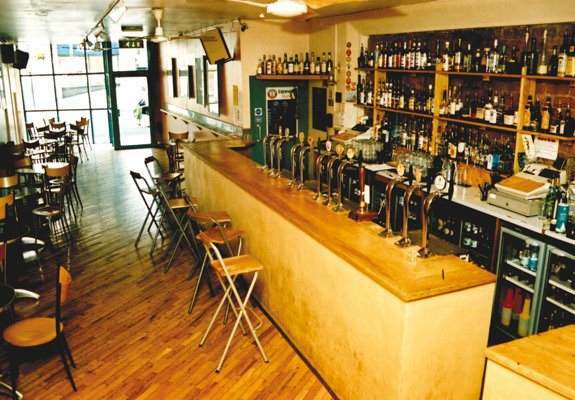 North began life focused firmly on the beer, and offered a huge range right from the start, attracting a discerning crowd of regulars, many of whom are clearly still there. Some may never have left. The bar is nondescript from the outside, maybe even a bit tatty, and looks much smaller than it actually is. You could easily walk straight past it. The decor is plain, simple and understated, all stripped wood and stools, with little decoration or flourish. It all looks achingly hip, but authentically hip in that ‘we didn’t try for this look, it just happened’ way some places have, to the point where a couple of friends, on their first visit the other week, wondered whether they’d ‘fit in’. One asked about the dress code, of which there is no such thing. He thought it looked like the sort of place that would entertain such a ludicrous idea. The bar itself is the real star of the place. North is famous (infamous?) for the breadth of it’s range of drinks. There is a clear continental bias, with a heavy focus on classic Belgian beers (the three Chimays, Duvel, Orval, a couple of Liefmans and at least another fifteen or so besides), alongside a good range of German and Dutch beers. There are some interesting bottles from North and Central America, too. On tap, there’s always a stout, a guest bitter and Rooster’s, the bar’s own beer, with much more besides this. Each time I’ve been to North, I’ve noticed a couple of people sat quietly, lost in a book or a newspaper, with a continental pint and a chunk of the bar’s excellent bread and some cheese on the side. This strikes me as an eminently civilised way to pass some time. It sums up what I think of North. The best bar in Leeds. No competition.